Sphaeralcea ambigua, Desert mallow, might just be the prettiest scrubby bush in the southwest and one of the most xerophytic native plants in the desert; ranging from California, Utah, Nevada, to Arizona. This versatile shrub performs beautifully as a perennial border, a specimen planting, or even in container gardens. The evergreen foliage of the desert mallow is broad, lobed, and distinctly woolly in appearance. 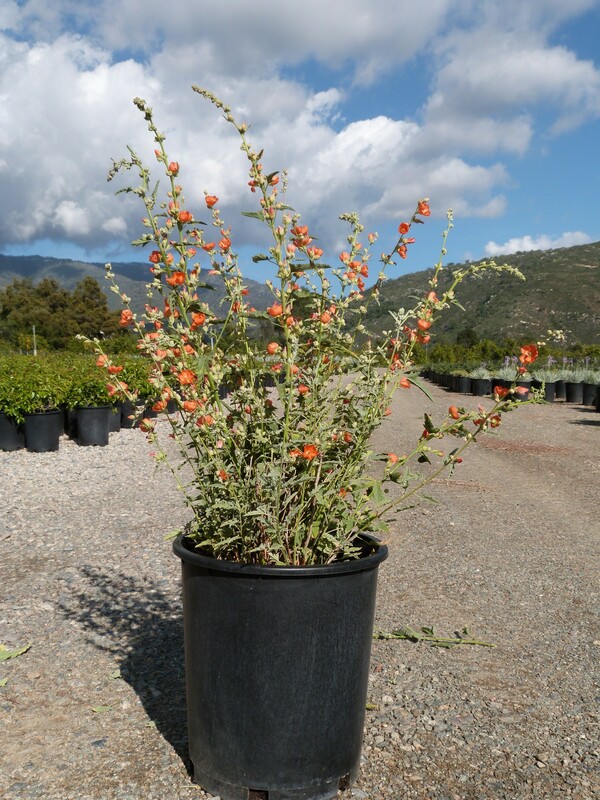 Large salmon to orange colored flowers form in clusters on upright new growth. These lovely flowers emerge in February and continue through November. Each flower has 5 petals with yellow reproductive parts and attract many pollinators, especially bees. Desert mallow thrives in full sun and tolerates poor soils, but needs good drainage. If you do not improve the drainage in your soil when planting, moisture in the winter months could potentially kill the desert mallow. Low water requirements once established, but additional water during the summer will aid in more flower production the following season. If the conditions are right, you may soon have seedlings of desert mallow, as it can reseed freely.